An online reputation assessment study by J Turner Research tracked more than 46,000 properties nationwide to rank the top 10 cities in online customer satisfaction. Ever wondered which cities in the United States are home to the most satisfied apartment residents? If you live in Raleigh, NC you are one of the lucky ones. In a first for the industry, J Turner Research, a Houston based, leading market research firm exclusively serving the multifamily industry has released a list of the Top 10 Cities with the Highest Online Customer Satisfaction in the United States in a study titled The Digital Mirror: Online Ratings and Reflection. In this exhaustive study, J Turner tracked and analyzed the online reputation of 46, 000 apartment properties nationwide. Based on an aggregate scoring scale of 1-100, the national average score in online customer satisfaction was 47. In 2013, Raleigh, NC tops the charts as the 'Happiest City' in online customer satisfaction by apartment renters with a final score of 54. For a prospective resident in Raleigh, NC there is a 68 percent chance that a property is rated at or higher than the national average. 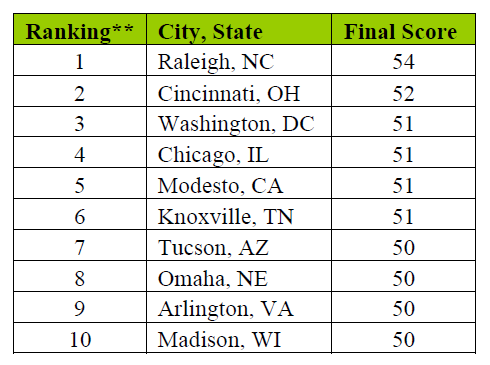 Cincinnati, OH was ranked second with a final score of 52, and Washington, DC was ranked third with a final score of 52, and Washington, DC was ranked third with a final score of 51. **Ranking is based on the score followed by the number of properties with online reviews on multiple sites. "Online reputation is fast altering the dynamics of every industry. The apartment industry is no different. The digital world offers an instant and influential platform for residents to make their voices heard. Residents across the nation have expressed their opinions to rate properties and J Turner has analyzed those ratings to determine the cities offering the highest customer satisfaction in the apartment industry," shared Joseph Batdorf, President, J Turner Research. "The Digital Mirror: Online Ratings and Reflections is the first of its kind study that provides the industry with information to assess the impact and evolution of the online reputation," added Batdorf. While Raleigh residents can consider themselves lucky, if you live in Aurora, CO, the story is different. Aurora is at the rock bottom of the Happiest City ranking. For a prospective apartment renter in Aurora, there is only a 17 percent chance for a property to be rated at or higher than the national average of 47. About the Study: The Digital Mirror: Online Ratings and Reflection. In this breakthrough study, J Turner tracked and analyzed the online reputation of 46,000 apartment properties nationwide. To overcome the challenge of multiple ratings scales, J Turner devised a statistical model that established a single score representing the aggregates of relevant sites. This score served as a benchmark to compare various properties, management companies, and cities. A city with at least 50 properties reviewed online was eligible to be ranked in this study which included 131 cities nationwide. Houston based, J Turner research is the leading provider of innovative, affordable, and business enhancing market research services for the multifamily industry. For more than a decade, through its unique survey methodology, industry benchmarking process and trending reports, J Turner has been empowering clients with monthly, actionable, and true operational intelligence to strategically enhance their business and marketing. The company offers a range of cutting edge services including monthly resident satisfaction surveys, real-time prospect feedback surveys, and the recently launched social media and online reputation assessment application among others. For more information, please call (281) 558-4840 or visit J Turner Research and schedule a short WebEx.